Drilling for oil began in the mid-19th century and up until the mid-20th century it was illegal to deliberately deviate from drilling vertical wells. This was due to a mixture of reasons such as avoiding collision with other wellbores and producing oil or gas which is not owned by the leaseholder. However, John Eastman changed all of this in 1930 when he was granted a patent to determine the direction and inclination of a wellbore. He achieved this using a plumb line, a compass and a camera, and simply took a photograph of the compass and plumb line while in the wellbore. Things have moved on significantly now, and we use a series of three accelerometers and three magnetometers. These are at right angles to each other, to determine how vertical the wellbore is by measuring the strength of gravity in the three directions and to measure the strength of Earth’s magnetic field, and therefore figure out which way is north. This system allows measurements to be taken while drilling, or the magnetometers can be replaced with a gyro to gain more accurate directional readings, but for this to work all operations must be shut down to reduce vibration. With a lot of wellbores being drilled in oil producing regions across the world it is becoming increasingly important to know the exact location of the wellbore underground. It is, of course, impossible to know this with 100% accuracy, so it is important to understand the errors associated with downhole measurements, and where the hole ‘could be’. Each measurement device has an associated error and when we combine all of these sources of measurement error we end up with an ellipsoid at each point in the wellbore, which represents all of the possible positions the hole could be. This ellipsoid increases in size as we drill further as our position underground is calculated from each direction, inclination and depth measurement, so the errors build up the further we go. 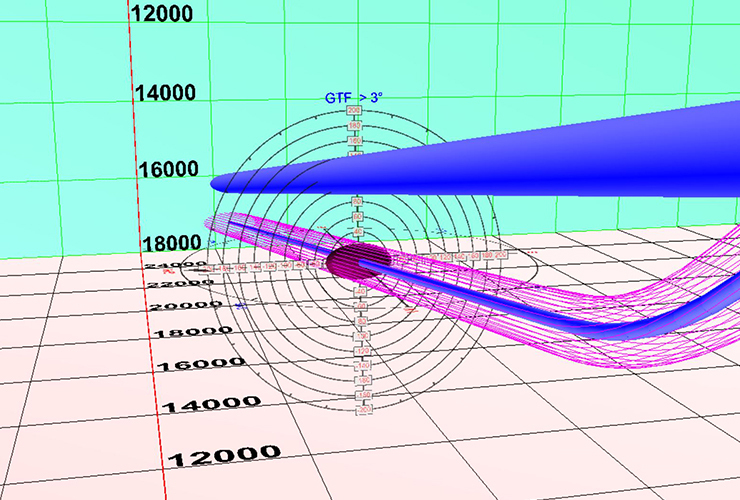 If the wellbore is plotted with all of the possible positions, this looks like a cone with greater errors at greater distances along the hole. At AnTech we deal with this uncertainty in both the planning and the operations stage. In planning a well trajectory we also plot the error ellipses, and consider where the wellbore could actually be in relation to where we want to go. In some cases this could be the difference between reaching the target reservoir or not. While drilling we continually check that the uncertainty in our measurements fall within the error ellipse that we have specified in planning. This is done by checking the magnetic dip and total gravitational field strength, which we know in our well location, and checking the spread of azimuth data. This quality control system, alongside our continuous stream of downhole data, provides the assurance that we know where we are drilling.